MANGALORE. 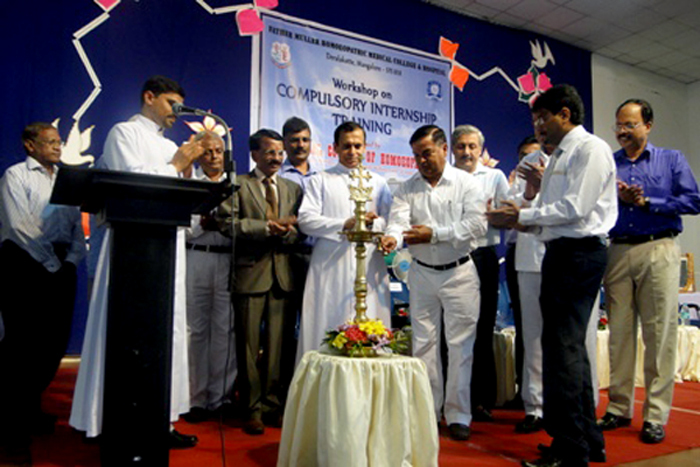 AUG. 23: The Central Council of Homoeopathy (CCH) has organized two days Workshop on “Compulsory Internship Training” in association with Father Muller Homoeopathic Medical College, Mangalore at the college auditorium. The dignitaries Rev Fr Patrick Rodrigues, Director, FMCI, Dr. Ramjee Singh, President, CCH, Dr. R. K. Manchanda, Director General, CCRH, Dr. M. K. Sahani, Chairman, Education Committee, CCH Dr. B. T. Rudresh, Executive Committee Member, CCH, Dr. Jose Issac, Chairman, Committee for Excellence in Homoeopathic Education, CCH, Dr. S. M. Singh, Chairman, PG Education Committee, CCH, Dr. Eswara Das, Consultant Advisor, Ministry of Health & Family Welfare, GOI, Dr. L. K. Nanda, Member, Education Committee, CCH, Dr. A. L. Patil, Member, Finance Committee, CCH, Dr. Manilal, Member, Education Committee, CCH, Dr. Ashis Datta, Assistant Secretary, Technical, CCH, Dr. Shivaprasad, Principal, FMHMC were present on the dais during the inauguration. Rev.Fr. Vincent Vinod Saldanha, Administrator, FMHMC welcomed the gathering. Dr. M. K Sahani, Chairman, Education Committee, CCH gave introductory speech. The dignitaries inaugurated the event by lighting the lamp. Dr. Ramjee Singh delivered his inaugural address. Dr B.T. Rudresh, the Guest of Honour, addressed the gathering followed by the message of the Director. Dr.Shivaprasad ended the inaugural session with vote of thanks. On the first day, Dr. Eswara Das, Dr. R. K. Manchanda, Dr. L. K. Nanda, Dr. Prabhakar Devadiga, and Dr. M. K. Sahani and on the second day, Dr. Manisha Solanki, Prof. Dr. Shekhar S Rajderkar, Dr.Hitesh Purohit, Dr. Pralay Sharma, and Dr.Mihir Pareek were the resource persons.